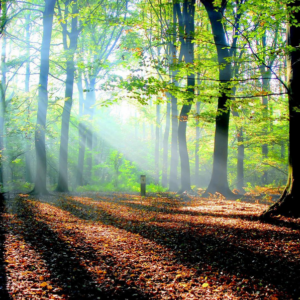 Sustaburn Biomass, Woodfuel & Renewable HeatingWhy biomass? It is a great fuel choice for people living in rural areas, who are off-grid for mains gas. It is efficient, reliable and heats up quickly. Wood fuel is from a renewable source, and so it will be there for future generations - unlike oil, coal, gas and uranium. Our biomass boilers are reliable and long-lasting, providing efficient heat for years to come. What is biomass and how does it work? Biomass is organic material, derived from living organisms, which is used as fuel to create energy. Biomass energy can provide heating solutions on a small or large scale. It can be used for both heating and hot water. 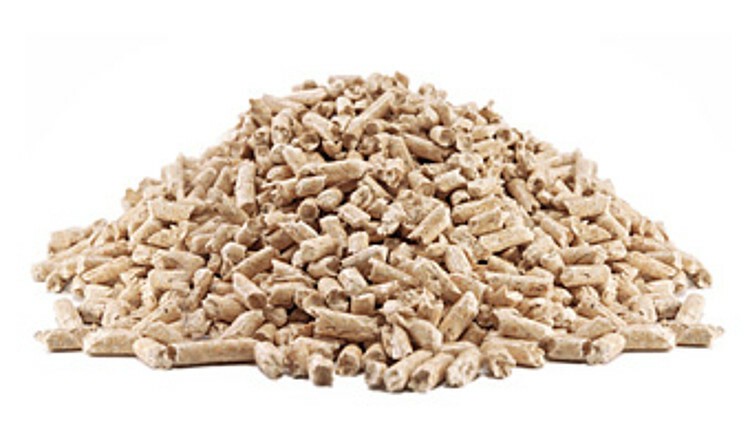 Our biomass boilers use wood fuel, in the form of pellets, wood chip or logs. The boiler burns these fuels, converting the energy into heat. It is an extremely efficient way of creating energy. Yes - the dictionary definition of renewable energy is ‘energy from a source that is not depleted when used’. Fossil fuels (oil, coal, and natural gas), which took millions of years to form, cannot be replaced once they run out. 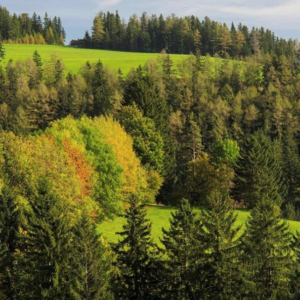 Our biomass heating systems use wood, which is sustainable, because new trees can be planted to replace those that are cut down. To qualify for the RHI payments, your wood fuel must come from an approved, sustainably-managed supplier. Yes - when wood is burned, just as with any fuel, carbon dioxide is released. But this carbon dioxide is the same amount that was absorbed by the tree over the time that it was growing. In this sense, it is carbon-neutral. There are in fact some carbon emissions caused by the cultivation, manufacture and transportation of the fuel, but these are much lower than the emissions from fossil fuels. According to the Energy Saving Trust, switching to biomass can reduce your carbon emissions by between 4.5 and 15.7 tonnes a year. In a world where climate change is becoming a harsh reality, switching to biomass is a huge step in the right direction. Can I get any financial support for installing biomass? You can find out more about any financial support available on the Energy Saving Trust’s website. The price of wood fuel can vary, but one clear advantage is its independence from the world market prices for other fuels like oil and natural gas. If you have the space to get your fuel delivered in bulk, this can reduce costs per tonne significantly. If you can source your fuel locally, transportation costs can be reduced. When the Renewable Heat Incentive (RHI) is factored in, it can make good financial sense to switch to wood fuels. 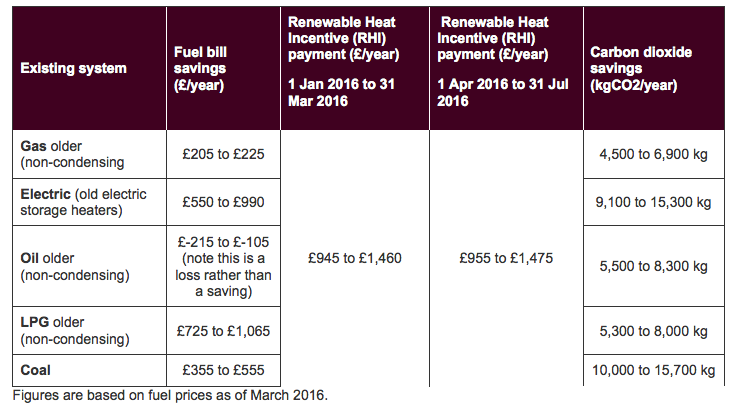 This table, produced by the Energy Saving Trust, shows estimated fuel savings, carbon savings and RHI payments that may apply if switching to biomass from other fuels. This is an illustrative guide only – each situation varies. Figures are based on installing pellet central heating in a typical four-bedroom detached house with basic insulation, and are based on fuel prices as of March 2016 – at this time, the price of oil has dropped – however, as oil users will be aware, the price varies and can be significantly more. Do biomass boilers need a lot of maintenance? Some of our boilers automatically clean themselves, keeping maintenance to a minimum. It is important to remove ash on a regular basis – but this is an easy task with KWB boilers. Some have automatic ash removal; others have a moveable ash container, which is simple to lift away and empty. Very little ash is produced: less than 1% of fuel volume. The frequency of ash emptying depends on the size of the system, and how much the heating is used. The boilers will need regular maintenance servicing, usually about once a year, depending on the size and type of system. We at Sustaburn will go through this with you - most of our customers choose to have their servicing done by us. You are unlikely to need planning permission, but you should always check. If the installation requires an outhouse, this will need to fit in with certain guidelines to prevent planning permission being needed. For more information on planning permission for biomass download the handy Energy Saving Trust guide. Would a biomass boiler work with my current heating system? Yes, a biomass boiler can be connected to most existing heating systems. Many biomass boilers operate at a higher temperature and pressure, so it may be necessary to use a plate heat exchanger between the biomass boiler and the existing heating system – this is usually a straightforward job for our installers. 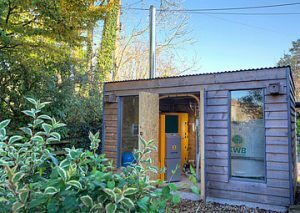 Is a biomass boiler noisy? No, you will hardly be able to hear your KWB biomass boiler running! This depends on the size of your heating system. Biomass boilers do take up more space than equivalent gas or oil boilers. Some of our boilers can fit in a footprint of just 0.75m2 , with fuel storage area and buffer tank added to this. Other more powerful boilers are much larger. Your choice of fuel storage and feeder system is also a factor. You may be able to fit your boiler into an existing space – other customers choose to build an outhouse to house the system (for an example, see the image to the right of this page). We will work with you to advise you on the best option for your particular situation. 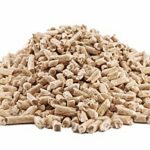 Wood pellets are standardised, cylindrical compressed pellets made from dry, natural recovered wood (sawdust, wood shavings) with a diameter of 4 to 10 millimetres and length of 10 to 50 millimetres. They are shaped by means of mechanical pressure without the use of chemical additives and using only natural substances as a binder. Wood pellets are available in small amounts (by the kilo) or large (by the tonne) – so you can use them regardless of how much storage space you have. Pellets are easy to use - a uniform, standardised fuel of a consistent quality. Wood chips are machine-chopped wood and are sold by the loose cubic metre (lm3). 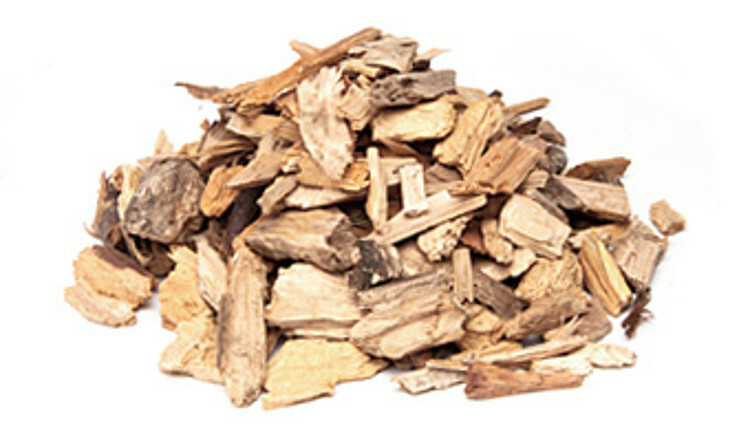 Fine wood chips with a chip size of approximately 3 centimetres are suitable for small systems with automatic operation. 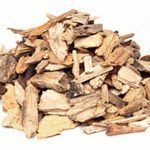 Wood chips are the cheapest form of wood fuel, as there is no need to fell a single tree especially for it (as you would with logs), and production costs are lower than for pellets. 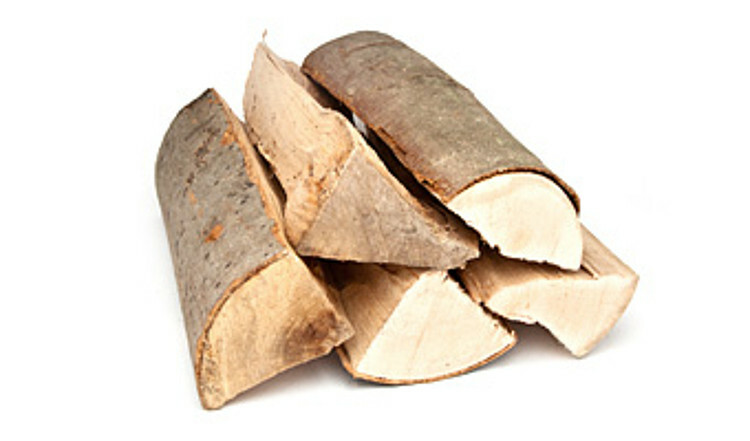 Log wood is supplied as metre-long firewood or chopped into stove-ready log wood in lengths of 25, 33 or 50 cm. The firewood is usually sold in stacked cubic metres (m3), and the water content should not exceed 20%, which means logs must be well seasoned. The advantages of the log-wood heating system is in the low fuel costs and in the regional availability of the raw material. 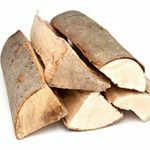 If you have room to store more than a year’s worth of logs, you can save money by buying unseasoned logs and letting them season for a year or two. Thanks to the Energy Saving Trust , who have kindly allowed us to link to their site and use their information for reference. The Energy Saving Trust do not endorse particular products or companies.